Create a unique accessory to jazz up your own wardrobe or to give as a special handmade gift. You don't have to be an expert at crocheting or beading in order to complete any of these crochet beaded bracelet projects. The following patterns are free to download, save, and print. Click on the image of the pattern you'd like to open up a .pdf document, then save the document to your computer for printing. If you need help downloading the patterns, check out these helpful tips. This delicate bracelet looks good with any outfit. 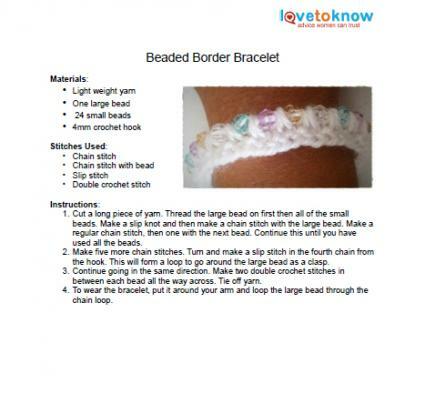 This project offers a great opportunity for beginner crocheters who want to make a quick but pretty bracelet. Click to download this bracelet pattern. Your friends will envy this smart two-tone crochet bracelet. Make several in different colors to go with all your outfits. Click here for this printable pattern. Simple yet elegant describes this easy-to-make crochet bracelet with an assortment of embedded beads. 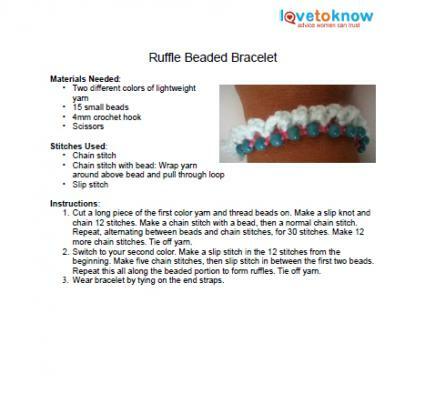 Download and print this bracelet pattern. Future Girl: This crocheted bracelet has a button clasp and a slightly vintage look. Beadline: The instructions on this site show you how to make a crocheted beaded rope. 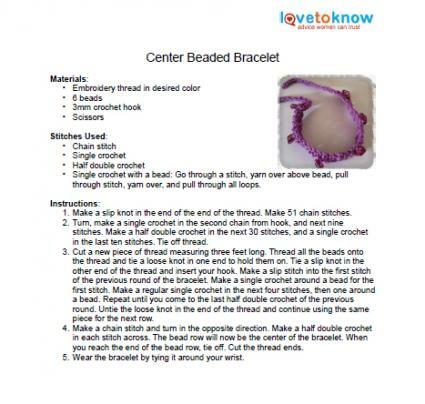 Adjust the length as needed to make a bracelet with a matching necklace or a belt. Craft Ideas: This site features a tutorial describing how to crochet a beaded bracelet using jewelry wire. Crocheting with wire takes some practice if you're used to working with yarn only, but this is a great way to add to the unique effects you can make in your jewelry designs. Making bracelets is a great way to use up small amounts of yarn that you would otherwise discard. They are quick and easy projects that you can take with you wherever you go. You can use different sized beads for a unique effect or make the bracelet longer and use it for an anklet.